The Human Grasp Assist, based on the robotic hand of General Motors' and NASA's Robonaut 2, is designed to allow the wearer to hold a grip longer and more comfortably. Tomorrow's space marines wear futuristic power suits for enhanced strength when fighting alien invaders in science fiction. As a possible step toward that future, NASA and General Motors have come up with a robotic glove capable of giving today's astronauts and factory workers an extra-strong cyborg grip. Such "Robo-Glove" technology emerged when NASA and General Motors (GM) built "Robonaut 2" as a robot assistant for astronauts living aboard the space station. 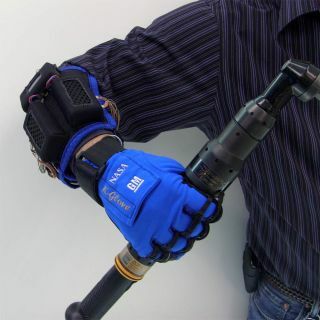 The glove's mechanical strength allows human wearers to grip tools longer and more comfortably — an astronaut working in a bulky, pressurized spacesuit might only need to use 10 pounds of force rather than 20 pounds to hold a tool in his or her hand. "The prototype glove offers my space suit team a promising opportunity to explore new ideas, and challenges our traditional thinking of what extravehicular activity hand dexterity could be," said Trish Petete, division chief of the crew and thermal systems division at NASA Johnson Space Center in Houston. The robot gloves could also help factory workers on Earth do their job for longer periods with less risk of repetitive stress injury, said Dana Komin, manufacturing engineering director for GM. "We are continuously looking for ways to improve safety and productivity on the shop floor," Komin said. "Our goal is to bring this technology to the shop floor in the near future." Such gloves rely upon a robotic sense of touch — pressure sensors in the fingertips — to detect when a human user is grabbing an object. When the wearer grasps a tool, synthetic tendons automatically retract for a firm, mechanical grip until the sensor is released. Engineers created the first version of the glove in March 2011, and a second generation version three months later. The most recent prototypes weigh just two pounds and use an off-the-shelf lithium-ion power tool battery attached to the human user's belt, but a planned third-generation version aims to reduce the size and weight of the system. "The K-Glove (Robo-Glove) is the first of what we expect to be many spinoffs derived from Robonaut 2," said Ron Diftler, Robonaut 2 project manager. "Another example is we're developing arms built on Robonaut technology to be used on NASA's multimission Space Exploration Vehicle."